While in imagination mode, I was brainstorming for the next “WOW” factor. All of a sudden, I flipped to a channel that was showing, “The Mummy Returns” (2001). I said to myself, “WOW…THAT WOULD BE HOT TO CONSTRUCT!” At the same time, I thought ‘naw…way too time consuming’ and I didn’t have a fix on the “how to” as well. 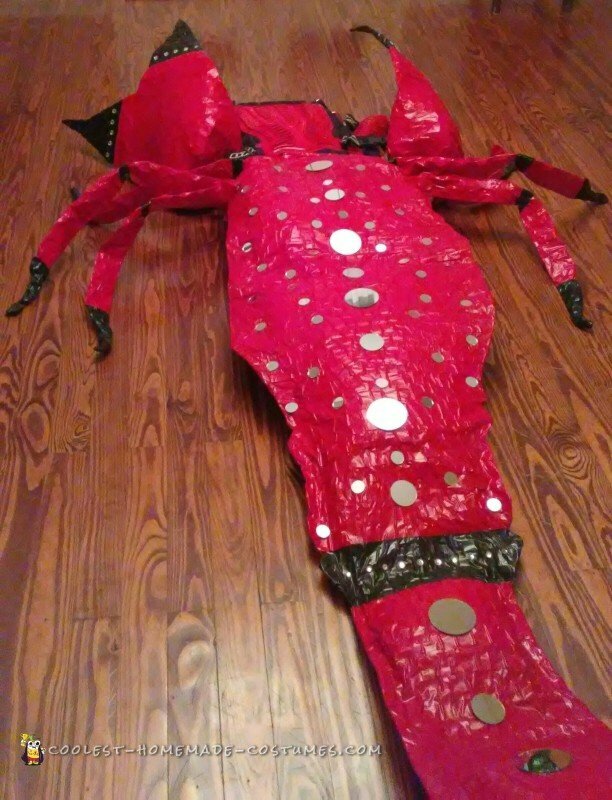 I previously constructed a costume which consisted of stilts (10 ft high), and I felt that my next design should be from one extreme to the next, so I came up with the scorpion (insect, on-the-ground version). The items I used were chicken wire, copper coil, red & black duct tape, polyester fiber fill (upholstery), baseball catcher’s chest protector, mechanic’s low profile creeper for mobility, utility gloves, wire cutter, zip/cable ties for fastening/shaping, Velcro, red spray paint, mirrors, and rhinestones. 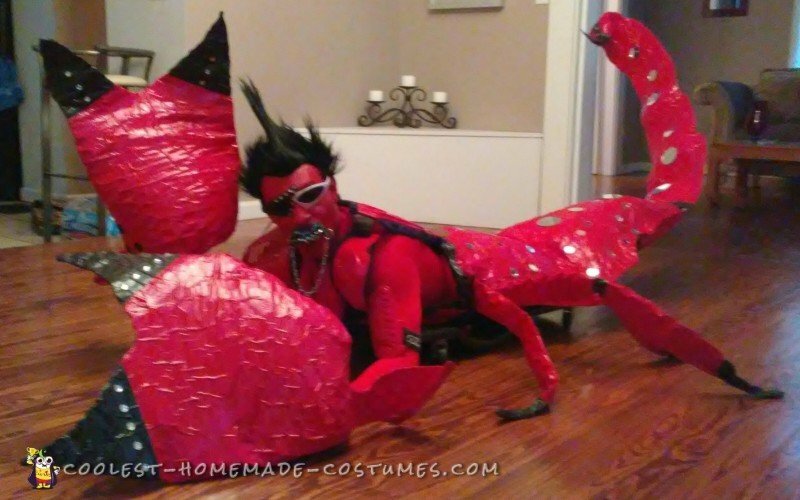 To design and construct my costume, I Google’d a picture of a Black Scorpion as a blueprint. From looking at the picture and myself (height & width), I used measurements and careful guessing to judge how much chicken wire I needed to complete the general frame using one sheet only. Whatever length I needed, I doubled it in order to perform a fold/cut/clamp method. The pinchers and legs were made with chicken wire as well. (I purposely made one larger than than the other because after viewing numerous pictures of scorpions, one pincher always seemed to be larger than the other). Thick copper coil was used to maintain the shape of the tail & stinger. Since the scorpion’s shell has a scaly appearance, I carefully and strategically applied the duct tape over the chicken wire in a layering/over-laying effect, and to to separate/accentuate, The folding, shaping, clamping and applying of the duct tape was the most difficult part. I used black duct tape. Rhinestones and mirrors were used to decorate, and serve as a Light catcher/reflector. For the pinchers, I used utility gloves that I rigged/wired open so my hands could easily slide in. The polyester fiber fill was used for a layer of protection/padding so that the duct tape wouldn’t cling to me. The padding also served as a means for comfort, so I wouldn’t lay directly on top of the chicken wire. The fiber fill was also used to add the puffy effect of the sectioned areas leading up to the stinger. 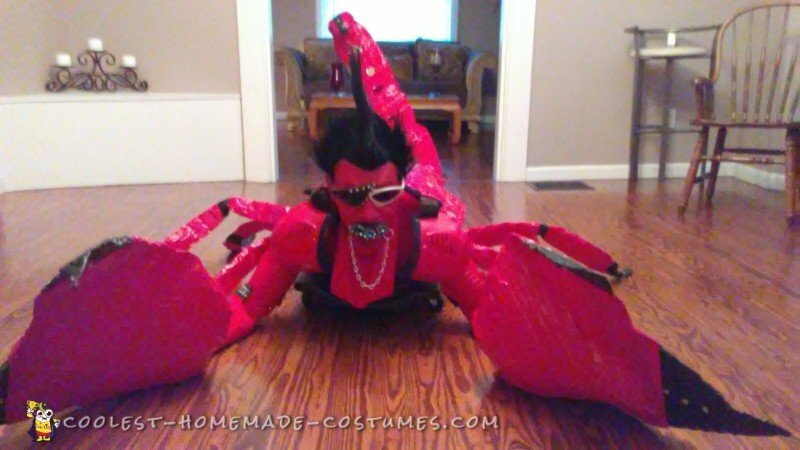 For mobility, I used a mechanics low profile creeper, which provided movement, forward and backwards…360° as well if desired…with Velcro added for gripping, and as a means to secure the costume on to the creeper so that I wouldn’t slip off. This was one of the coolest things because along with this versatile mobility, I could also move my tail/stinger up, down, left and right. The baseball catcher’s chest protector served as a way to cover and give a unique/macho look. Putting on the costume felt amazing because it was a sigh of relief. I pulled off a striking and well constructed design of such complexity. When I crawled out of hiding (the make-shift dressing room), the people applauded, whistled, and shouted, which felt amazing (a confidence builder I might add).